We do not stop exercising because we grow old – we grow old because we stop exercising. Ironically, these phrases are often said while we are in the midst of doing exactly the opposite to what we’re saying! But there is great truth in these phrases as eating well and being physically active are both essential to good health and independence. They are key factors if your goal is to remain independent and in your home as long as possible. Statistics Canada reports that 34% of Canadians, aged 65 years and older, are at risk for poor nutrition. How can that number be so high, you ask? The reasons are plentiful: tight budgets; mobility challenges that limit access to grocery stores; and changes in appetite or taste due to illness, medications or even depression. If you need to incorporate changes in your diet, you may want to talk to your health care provider. They can provide you with an assessment on your nutritional needs and identify if there are any deficiencies in B12, magnesium, calcium or Vitamin D. There can be issues, in these areas, with absorption, in your senior years. This would also be a good time to review, with your pharmacist, if any existing medications are impacting the absorption of certain minerals or vitamins. Limit sugar, trans fats and salt. Focus on foods that include fibre, minerals and vitamins. The more colourful your fruits and vegetables, the better! Ensure there are a good variety of whole grains, beans and/or lentils and lean protein. Remain hydrated, by drinking plenty of water, as hydration helps to maintain bodily functions and regulate body temperature. The perfect partner to nutrition is physical activity. Ideally, you want to be doing something that contributes to your balance, strength and flexibility. This triple combination will enable you to move around more easily, reduce your risk of falls and, overall, play a key role in retaining your independence. Physical activity doesn’t mean that you have to run out and join a gym. It can start with a walk around the neighbourhood. Bring a friend with you and you also have the bonus of social interaction. Contact your local seniors’ centres and see if they offer classes in tai chi, yoga or stretch classes. Many places offer modified exercises so that if you’re only able to exercise while seated or can’t do the full range of physical movement, you still can achieve the benefits of movement. Good nutrition and movement extends beyond just the physical benefits. Aside from boosting your self-confidence and capacity to be able to simply ‘do’ more things, exercise also works like a natural anti-depressant. It can also contribute towards a good night’s sleep and we all know how that helps us approach our day more positively and with greater clarity. So, are you ready to step out the door and head towards a healthier you? 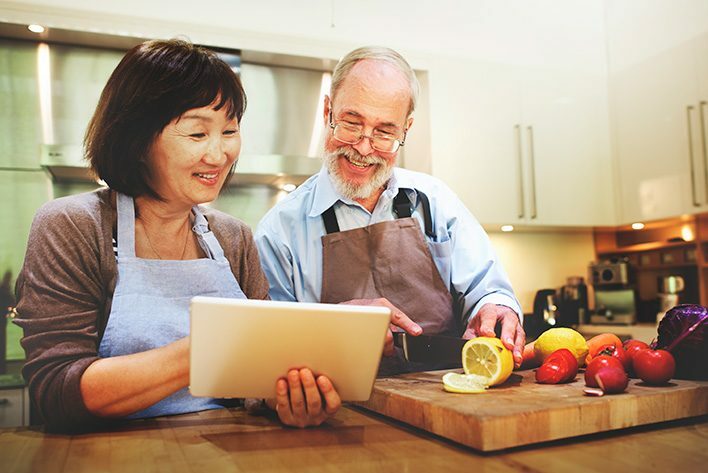 Bayshore’s caregivers can help you get healthier by preparing nutritious meals and doing grocery. Call us today to learn more.